Symphony Nova Scotia has a long history with the Nova Scotia Youth Orchestra, taking a leadership role in mentoring young talent and collaborating on complex and highly demanding musical programmes. The Two Orchestras concert has become an exciting annual tradition that challenges and inspires all the musicians and treats the audience to epic performances with a massive sound. Two violinists recently talked about their experiences with the collaboration and what they learned growing up with music. Isabelle Fournier and Katelyn MacFadyen at the rehearsal for Two Orchestras in February. Isabelle Fournier is Principal Second Violin with Symphony Nova Scotia. She studied at the Royal College of Music (U.K.), and The Juilliard School. Performing extensively throughout Canada, the U.S., the U.K., Europe, Japan, and Taiwan, she has worked as a Chamber Musician, Orchestral Musician, Soloist, Teacher, Adjudicator, and more recently, as Music Director. From 2009-2012 she was also Concertmaster of the McGill Chamber Orchestra in Montreal. Isabelle has been playing on and off with Symphony Nova Scotia since 2002. During that time, she performed with the Youth Orchestra about a half a dozen times. 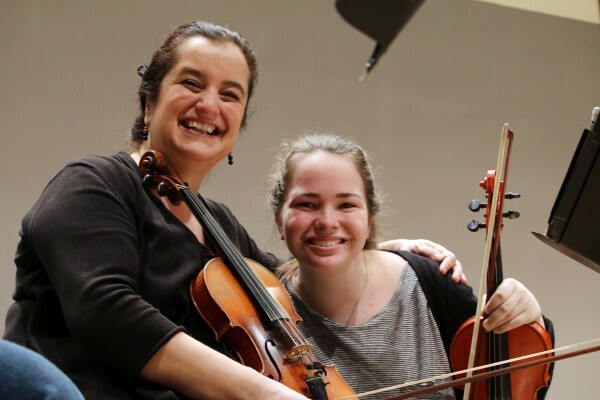 “Working with the Youth Orchestra is special for me because it brings back memories from my own youth. 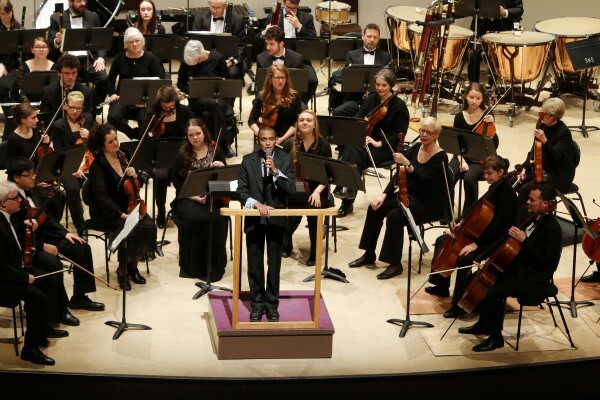 “I grew up in Moncton and started with the New Brunswick Youth Orchestra when I was ten. I also joined the Nova Scotia Youth Orchestra when I was 13. Every weekend I would go to one or the other. I was involved with both until I was 16 when I moved to England. “The energy is great. The kids have been preparing for this performance for a long time and their excitement is contagious. “It’s who I am. I can’t imagine not being a musician. I like all kinds of music, but for some reason, classical music speaks to me. “I remember the first time that I consciously heard a violin. I was four years old. It was on a record I found at home – Rimsky-Korsakov’s Scheherazade. The violin solos have special meaning in that piece and I remember sitting beside the speaker transfixed by what I was listening to. I wanted to play that sound! “Learning to play an instrument, training and practicing: it’s a slow process. Music is also like a team sport. It teaches you how to get along with people. You put your personal issues aside to make music. “My son, Maxim, started with the violin but now plays the cello and the tuba. (He likes the low notes.) When he started lessons six years ago he had many competing interests; soccer, science, the outdoors. His involvement in music is something that has grown over time – taking up more and more space in his schedule. He gets a lot more out of it now. Next year, he wants to join the Youth Orchestra. “Versatility is important and an openness to new ideas. I recommend learning more than one instrument, if at all possible and you really need to be prepared to get out and meet people and initiate projects. “When I was in school at Julliard, students trained in certain categories; solo, chamber, or orchestra. The music industry has changed a lot since then. The era of the soloist was very short lived and training is quite a bit broader now. Katelyn MacFadyen is Principal Second Violin with the Nova Scotia Youth Orchestra and a grade 12 student at Sacred Heart School in Halifax. She has played the violin for 12 years and was involved for a time with the Maritime Conservatory for Performing Arts Orchestra. Katelyn also plays the French horn in her high school band and sings in Soundtrax, a SATB Choir from Halifax Music Centre. The choir performed two concerts with Symphony Nova Scotia recently: Video Games Live and the Music of Queen. “I joined the Nova Scotia Youth Orchestra (NSYO) in Grade Seven. When I started my friend and I were the youngest and we were way at the back of the violin section. “We have a joint concert with the Symphony every year and NSYO does a lot to prepare for that. There are typically two or three rehearsal weekends (20-30 hours) and depending on the repertoire and instrument, there can also be upwards to 20 hours of personal practice time before we team up with the Symphony. “Over the years we’ve worked with the Symphony, I was able to learn a lot about how the orchestra runs; how they work together as professionals and how leadership comes into play. At NSYO, I am Principal of the Second Violins and I have my own ideas about mentoring. For example, after rehearsals I usually send out an email to my section laying out certain things we need to work on for the next time. At NSYO there is a bit of a family dynamic. We are friends bonded together over music. There is guidance but it is peer to peer. At the Symphony, I enjoyed seeing how adult professionals mentor young musicians and how the Youth Orchestra interacted with the Symphony. There is a strong French culture in the violin section and great camaraderie. “Performing with the Symphony gave us the opportunity to play pieces that NSYO wouldn’t normally get to play because of the complexity or the need for a massive orchestra. We get to make the music come to life. “Music is so important to me. It’s my creative and emotional outlet. It allows me to express myself… and it provides me with a fantastic community. The NSYO, the Symphony, we all have a connection through music.